Mistletoe may be perpetually associated with holiday romance, but it is also becoming big business and despite its reputation as a tree-killing parasite, the plant plays an important ecological role. Each December, the annual mistletoe auctions are held in the town of Tenbury Wells in England. The affair attracts buyers from all over the UK and has now become something of a tourist attraction. Auctioneers estimate that this year they will sell twenty to thirty tons of mistletoe at between sixteen and twenty pounds, or about $26 to $33, per bunch. Buyers will mainly be retailers from garden centers who will then divide the bunches into tiny sprigs, which they will sell for around the equivalent of about $3.29 each. Quality is expected to be low this year following a wet summer that resulted in berries being slightly yellow but, this is unlikely to diminish demand in any significant way. Throughout much of the West, mistletoe has been regarded as a symbol of fertility and at Christmas is used as a decoration and meeting place couples, who are required to kiss under a sprig—a real bonus for the office letch at company Christmas parties. Mistletoe was considered holy by the druids, who regarded it as an aphrodisiac but our more recent tradition of kissing beneath it appears to have been taken from the Scandinavians, who associated it with peace and love. Today, it is mainly English-speaking nations who adhere to this tradition, which my French hosts find quite bizarre. 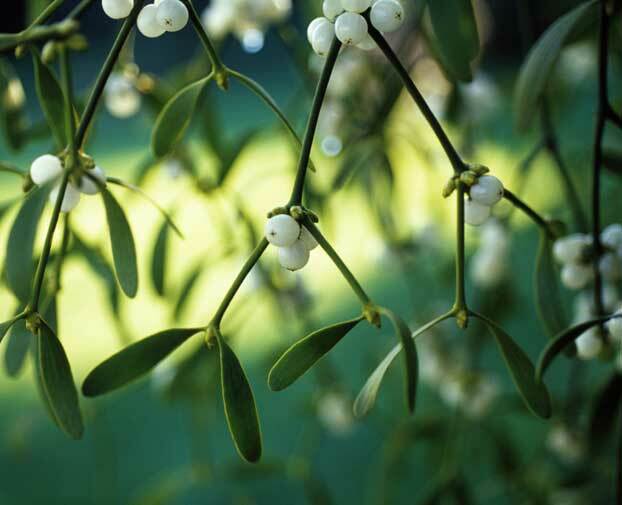 Mistletoe is a hemi parasite that will grow on at least two hundred different types of tree. It does particularly well here in France and as I write this article I can see at least twenty large bunches hanging on a poplar tree opposite my window. It has evergreen leaves that do some photosynthesis but it gains most of its nutrients from the host plant. Studies have shown that though small, this plant is a keystone species in terms of biodiversity. It is entirely reliant on birds for seed dispersal but provides much needed sustenance for those birds during the lean winter season. It also provides nesting habitat and supports a variety of insects and fungi. Kew, Chelsea Physic and Lambeth Palace Gardens are all experimenting with introduction programs. There are also some positive results coming out of tests for the use of mistletoe in the treatment of cancer, although these are still in their early stages. Deliberate attempts to cultivate this plant are still in the infancy. Until now it was mainly a byproduct that grew in apple orchards and provided a little cash for farmers in the winter months. With many of the ancient orchards having been ripped out in England, it has suddenly become apparent that the demand for mistletoe could become an economic force of its own. Much of the mistletoe at the Tenbury auction this year will have originated in France. You can quite easily grow mistletoe in your own garden. Pick some plump fresh berries in late winter and rub them on the underside of a young tree branch of around twenty centimeters in diameter. Mark the spot and expect to wait up to four years before getting any fruit. Remember the plants are dioecious, meaning only the female will carry berries. There are many different species of this plant but the one which you are after is Viscum album, which is the traditionally used European variety as this is the most effective at encouraging kissing. This entry was posted in Holiday Decorating, Holidays, Uncategorized, winter garden, winter gardening and tagged Christmas, Christmas decorations, England, garden, gardening, mistletoe, mistletoe auctions, Viscum album. Bookmark the permalink. What an interesting plant. I’m curious about the cancer research.